If you haven’t heard of the heavy metal band Disturbed, then you must be living under a rock. They’ve been around since 1994 and originate from Chicago, Illinois. The band is made up of members David Daiman (singer), John Moyer (Bass Guitar), Dan Donegan (Guitar and Keyboard) and Mike Wengren (drummer). They are most notably recognized for their remake of Simon & Garfunkel’s “Sound of Silence”, which happens to be a very powerful cover for the band. Even people who did not appreciate Disturbed for their ‘heaviness’ became fans after they heard them do their version of the classic song. To date, they have 7 studio albums; The Sickness (2000), Believe (2002), Ten Thousand Fists (2005), Indestructible (2008), Asylum (2010), Immortalized (2015) and Evolution (2018). David Draiman had recently mentioned that he did not want to tour a lot, but that looks like it’s about to change. 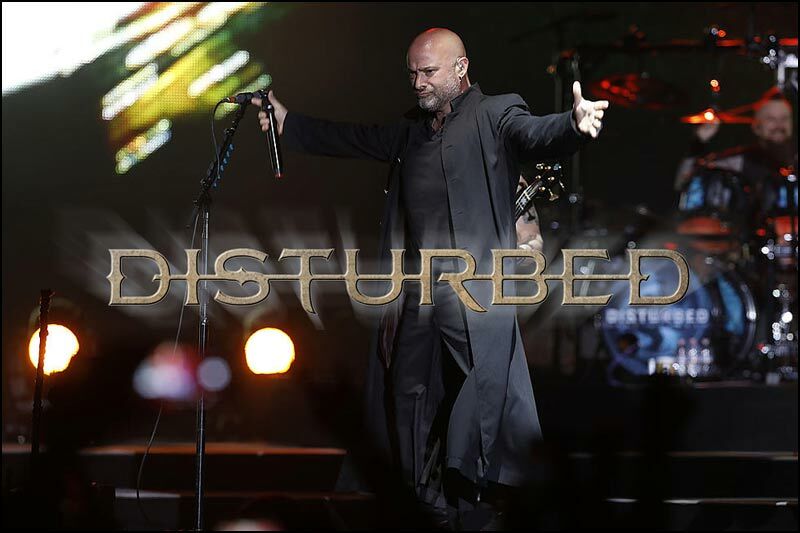 Heavy metal icons of the band Disturbed released a decent amount of new North American tour dates the band will partake in. Just after the band ended their most recent European run of concerts, which supported Evolution (their recent seventh studio album), the heavy metal rockers will zig-zag most of the country and part of Canada while going on their next leg of their 2019 trek. If you take a peak down below, we have all the new Disturbed tour dates listed out, along with links to look for tickets. The schedule begins late spring with a show at the new Sonic Temple Art & Music Festival, and goes on through the summer in North America, including a few Canadian concerts. Their tour then ends up with a good amount of Midwestern shows which take place later on in the fall. Disturbed will be supported by either Pop Evil or In This Moment on certain shows of the tour. Down below you will find the list of Disturbed tour dates, links to look for tickets, plus some cool Disturbed music videos. Disturbed adds summer and fall tour dates to 2019 tour. So much for David Draiman saying that he didn’t want to tour a lot. Don’t forget to check back here often to see if Disturbed extends their tour by adding more dates.